Your host for the 2015 Conference, held 9-12 October, was Abdulwahab Baghdadi of 3rd Dimension EvenTech, a Saudi-based ILDA Corporate Member. The company is a leader in event and technology integrating the latest products and service in the GCC region since 1990. 3rd Dimension EvenTech was the first Arabic ILDA Member. Phaenon lasers for the event were provided by Michael Sollinger of LaserAnimation SOLLINGER. Assisting with the setup was Holger Walter, Yousri El Gazar, and Mohamad Kashif. Thank you to our Gold Sponsor Coherent Inc. and our Silver Sponsor Laserworld Group for helping to support the 2015 ILDA Conference. Friday, 9 October: In the evening is the first official Conference event, the Welcome Reception and Dinner. This takes place on the wooden Al Mansour dhow (boat) sailing up Diera Creek. Boarding is across from our hotel (Radisson Blu) at 8:00 pm; the dhow sails at 8:30 pm. We return at 10:30 pm. Saturday and Sunday, 10-11 October: ILDA Business Meetings, seminars and workshops. The Lase-Off and Laser Jockey competition is Saturday night. The Awards Banquet is Sunday night. All meals are included. Monday, 12 October: NEW TOUR ADDED: There is an optional city tour from 10:00 am to 1:30 pm. Sign up for this optional event (USD $40) to visit the sights shown below. A box lunch (sandwich, chips, drink, treat) will be provided upon returning to the hotel at 1:30. 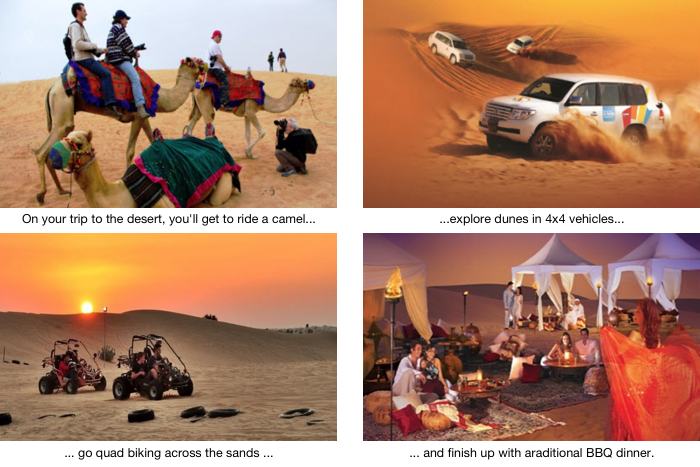 Later on Monday 12 October, all ILDA Conference attendees (e.g., all Full and Spouse/Guest registrations) are invited to go on the free Bedouin-inspired Desert Safari. This leaves the hotel at 3:30 pm. It includes the camel, 4x4 and quad rides shown below, plus henna tattooing, shisha smoking, sand boarding, falcon show, belly dance and Tanura shows, and a complete BBQ dinner (vegetarian foods also available). We return to the hotel at approximately 9:00 pm. 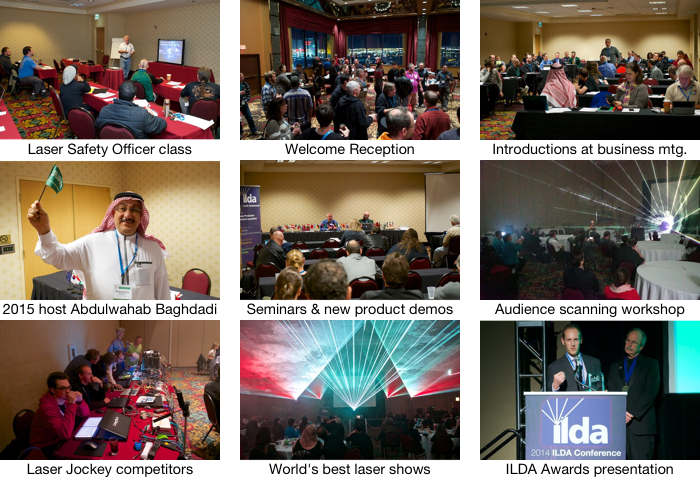 If you've never been to an ILDA Conference before, check out the photos below or the five-page report on the 2014 Conference which starts here. Hotel room reservations are separate from ILDA Conference registrations. Contact the hotel directly, in order to make your room reservations. The ILDA Conference is at the Radisson Blu Hotel, Dubai Diera Creek. Located just 15 minutes from the airport, it is in the scenic Old Dubai tourist area. The Union Metro Station is only 300 meters away. The hotel offers proximity to numerous shopping malls, traditional markets and the business district. If you have never seen the amazing city of Dubai, be sure to add some additional days for sightseeing. ILDA's hotel rates are good for stays from 6 October through 15 October -- three extra days before the Conference, and three extra days afterwards. The ILDA rates below include breakfast, and Wi-Fi in guest rooms. All rooms have private balconies with views of the Creek and the Dubai skyline. Important: We highly recommend that you book directly with the Radisson Blu Dubai Deira Creek hotel at +971 (4) 222 7171 or cindy.botes@radissonblu.com and state that you are with the ILDA group. This will assure that ILDA is properly credited for your stay. If you do not use this method, your ILDA Conference registration cost will be $250 higher to cover ILDA's hotel contract penalties. The major airport, served by world cities, is Dubai International (DXB). To get from DXB to the hotel, you can take a taxi ride lasting about 15 minutes. There is some additional information here. Or take the Dubai Metro Red Line from Terminal 1 or Terminal 3, and travel 4-5 stops to the Union Square Metro station. It is a 7-9 minute walk from Union Square Metro to the Radisson Blu hotel. • Drugs, both illegal and some pharmaceutical -- There is a zero-tolerance policy. This extends to both illegal narcotics as well as some prescription and over-the-counter drugs. For example, do not bring codeine-based painkillers into Dubai. • Drinking -- You can drink in the hotel and ILDA-sponsored events, but do not drink in public. Also, do not be drunk in public. • Clothing -- Wear modest clothing; shoulders and knees should be covered. Avoid tight, short, low-cut, skimpy or suggestive clothing. • Public displays of affection -- Keep any kissing and holding hands private, behind closed doors. Married couples holding hands is a gray area so refrain from PDAs to be safe. • Speech -- No public cussing, nor any disparaging remarks about Islam or the government. Remember both that you are a guest in a Muslim country, and that not all countries allow Western-style freedom of speech. • Photography -- It is considered rude and intrusive to take photos of people, especially women, without expressed permission. • LGBT - The UAE is not as understanding as some other countries. It is not welcomed to flaunt LGBT lifestyles or pride. Just like heterosexual couples, refrain from public displays of affection. Be who you are but be discreet to avoid any issues. • Left hand -- The left hand is traditionally not to be used with others from a respect point of view, so avoid using it in certain circumstances. Don't shake hands left-handed; don't open doors or eat food with the left hand. Use your right hand when handing somebody something, especially food or any thing to give to others should be by right hand. One great reason for traveling is to experience other cultures and see different lifestyles. Part of this experience is being sensitive to local customs and laws. Be aware of the above guidelines and you can still have a great time in the exotic, vibrant city of Dubai. All prices US Dollars unless otherwise noted. To register for these, go to the Event registration page. Includes all meals, Welcome Reception, Lase-Off, Awards, business meetings, seminars, workshops, and desert safari. Full Conference registration does not include Laser Safety Education classes, which are separate Conference events. Also, Full Conference registration does not include hotel room reservations, which are made separately with the Radisson Blu. Full Conference registration prices shown below include a $250 credit for all persons who directly book by phone or email with the Radisson Blu Dubai hotel as part of the ILDA group. Important: if you do not book direct with the Radisson Blu at the ILDA group rate, your ILDA registration cost will be $250 higher than shown below, in order to cover ILDA's hotel contract penalties. *Spouse/guest includes meals, Lase-Off, Awards and Desert Safari. Does not include business meetings, seminars or workshops. A spouse/guest is defined as any person staying in the same hotel room as a Full Conference attendee. • Optional city tour, Monday 12 October, $40. See top of this page for a description of the three sights you will visit on this tour.